Selecting the right equipment is also a great way to save energy. Sure you could use a carpenter’s hammer to drive a railroad spike, but it is not very efficient, and while a sledgehammer is more common, an automatic spike driver can make the task nearly effortless. However if you are only driving a single spike, the additional energy required using the automatic option becomes cost prohibitive. A review of your material and process by the equipment manufacturer can help you avoid the pitfalls of under or over selection. Testing helps determine the most efficient processing technology to meet production needs. The right equipment saves time and money in the long run. Full-scale testing provides precise size reduction solutions for the exact material/s and a demonstration of a specific model before purchase. Compression -- squeezing and pressing down on a material until it breaks. Design parameters that drive size reduction crusher selection include production requirements, material characteristics, project location, climate conditions, capital cost, safety and environment, the life of product/expansion plans and maintenance requirements. Some types of machinery can last decades. Buying the wrong equipment can have long-term consequences in the cost of consumables, lack of production and downtime. Yearly consumables alone could exceed half the cost of the unit. Size- reduction equipment is typically integrated into a large system. By choosing the wrong equipment, it could inadvertently create a bottleneck that affects the productivity of the overall system. Test facilities have hundreds of reports on file that may match your application, saving the expenses of preliminary testing or in the selection of the proper size reduction method. Frequently the staff has experience crushing your material or a similar material. New applications are compared to existing reference data for similar applications. Past tests provide valuable insight into how to configure equipment and plan tests. Choose a test facility that has a range of different size reduction methods. A full complement of hoppers, mechanical conveyors and screens enable test plant technicians to replicate both open and closed systems. Full-size crushing equipment is best for dependable results. It is difficult to scale up crushing results from a lab-size crusher. Lab machine tests may not determine the actual horsepower and machine size the project requires. 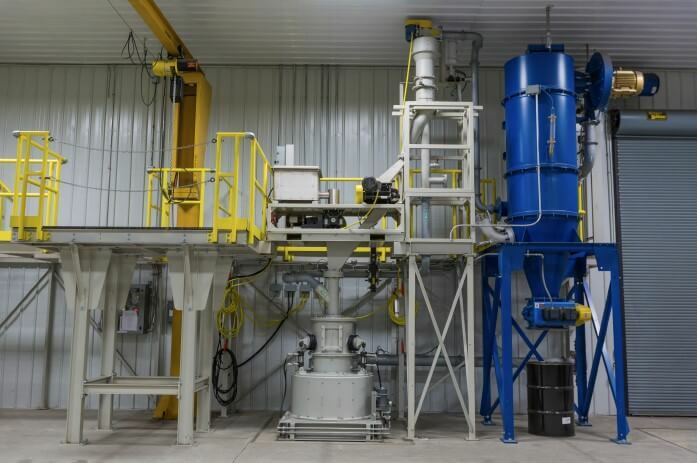 Is the test plant set up to provide real-world conditions in which customers can view their materials being processed -- from feeding, through size reduction and discharge/separation? Does it have an open slot to allow for the installation of other machines on an as-needed basis? Are there cameras to provide live video feeds of materials as they are being processed? Once the testing is done, toll processing, in the same facility, can produce enough product to test downstream processes, such as briquetting and extrusion, in the future facility to ensure that the process will perform as expected. Remember, the goal is to find an application solution rather than simply buying equipment. A material with high moisture content may become gummy and build up on the inside of the crusher. Moisture has a cushioning effect and can cause the material to stick together reducing productivity. When material buildup is a concern, the addition of equipment heaters and air cannons can be used to reduce build up allowing for more efficient operation. Brittle materials are easily crushed, but the process may create too many fines. Heat-sensitive materials may need cooling systems. Getting the material to the test facility may be a problem. Can the consistency of the material change during shipping to the test plant? Can the facility restore your material to its as-shipped condition? For typical tests about 200 to 500 pounds of material are required. First steps are sampling of the raw feed to establish the input gradation, moisture level and creating a plan for crushing tests specific to the project goals. To achieve the desired particle size and consistency, the test facility will consider: particle size distribution (the percentage of lumps versus fines) as it enters the crusher, feed control (Will it become gummy or sticky?) and how material is taken away from the crusher. If the material has a large percentage of fines, it’s more efficient to separate the fines with a screener first. Only the oversized material goes through the crusher. Plan to spend a few days observing the testing process and all the procedures necessary to produce the required end product including preparation, loading of your material and RPM sets for fine to coarse production. You’ll witness the real-time horsepower consumption through start up and full load. Test plants are operated in either open or closed circuit. Open circuit means the material passes through the crusher once. Closed circuit means that material is re-circulated back into the crusher if it doesn’t pass through a certain screen mesh. In closed circuits, as much as 30 percent of material may re-circulate before meeting size requirements, which increases energy use by 30 percent. 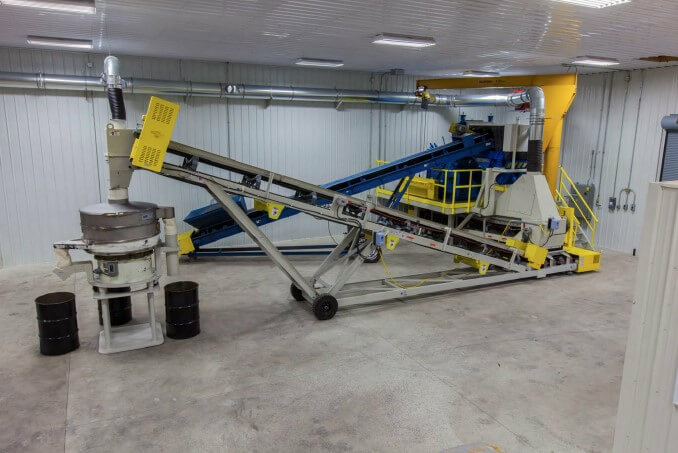 If needed, the test facility will run your material through various crushing methods and/or determine how to fine tune the crusher’s configuration for your process. 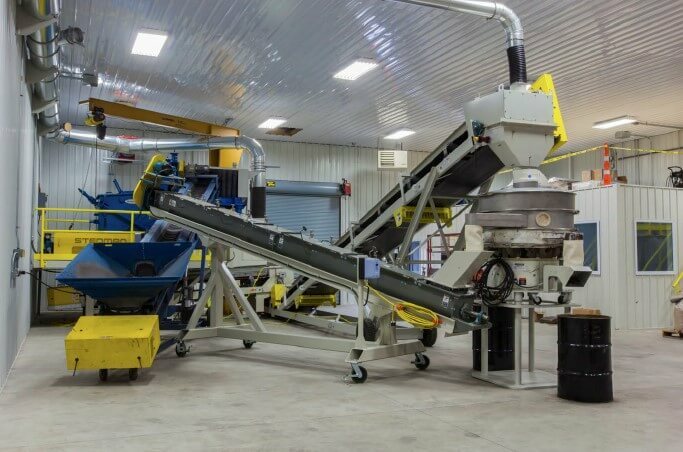 Two different type crushers may effectively reduce your material at the specifications you need, but one may require much less horsepower and less cost to operate. Abrasion Test to determine if an impactor is feasible for a particular application and to estimate hammer wear life. Performance data obtained on test plant equipment are scalable to accurately predict outcomes achieved on production models. Once your tests are done, the sales engineer will make recommendations for equipment type and size, open or closed circuits and other equipment like air cannons or heaters to loosen caking or sticky material. The equipment selected should produce the same particle size distribution as the test unit and the energy required at the production throughput rate is scalable from the test equipment. Size reduction expressed in the simplest form is: “Material + Energy = Size Reduction.” Experienced, knowledgeable size reduction equipment suppliers will guide a customer through the correct questions and recommend the best-suited method for any specific materials. Reputable suppliers will refer customers to other equipment manufacturers with better-suited styles of equipment when their products are not suited to the application. In conclusion, following these simple steps when and where you define your product and process, perform testing and consider your installation, you will succeed in buying a crusher that will provide years of trouble-free processing. 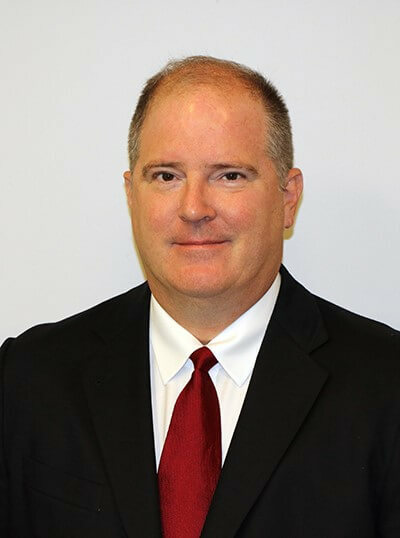 Chris oversees new machinery and system sales as well as well as the newly expanded testing and toll processing facilities. Chris graduated from the University of Cincinnati with a degree in mechanical engineering and earned his MBA there. He has more than 30 years' professional experience in size-reduction and particle-size separation.